The planet’s climate is constantly changing, warming and cooling periodically; it is a naturally balanced cycle which has been occurring since the dawn of time. However, during the last century there has been a noticeable warming period which may not be entirely due to the natural cycle. In 1996, the Intergovernmental Panel on Climate Change (IPCC) report on the subject announced that there has been a 0.60C since the mid 19th century. It is not understood why this period of warming is occurring so rapidly, it is thought that human activities may be playing a part in exacerbating the natural heating cycle of the planet. The greenhouse effect is the planets natural way to heat the earth. It involves short wave radiation entering the Earth’s atmosphere from space where it is converted into heat, which has a longer radiation wave length. Greenhouse gases (see next section) absorb this longer wavelength, preventing it from being reflected back into space. Greenhouse gases maintain the Earths surface temperature at an average of 150c rather than the 2180c it would be without it! The higher levels of greenhouse gases in the atmosphere are exacerbating the natural cycle and are increasing the Earths average temperature. 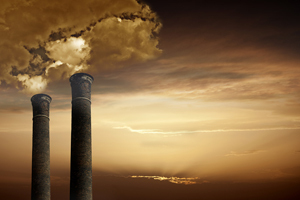 Greenhouse gases can be produced naturally and from human activities. The main greenhouse gases are carbon dioxide, ozone, water vapour, methane and chlorofluorocarbons (CFCs). There are many others that also contribute to global warming. Carbon dioxide can be produced by natural processes and by human activities. Plants use carbon dioxide during photosynthesis which is usually naturally balanced with the amount of carbon dioxide produced by organism respiration. The burning of fossil fuels and forests has increased the overall amount of the carbon dioxide in the atmosphere during the past 200 years, which is believed to be 30% higher than before the Industrial Revolution. Methane is produced naturally by anaerobic respiration in waterlogged land, landfills and in the intestines of some animals, particularly cattle and sheep. An increase in cattle and sheep farming has lead to a dramatic rise in methane production. Ozone is a naturally existing layer which is found between 12-50 kilometres above the Earth. Its role is to absorb ultra violet radiation entering the Earths atmosphere. Water vapour plays a key role in global warming and the greenhouse effect. Water vapour in the form of clouds can either cool the Earths surface by blocking the suns rays, but can also increase the temperature of the Earths surface by acting as an insulating blanket. Water vapour can act as a positive feedback mechanism in climate change. Water vapour in the form of clouds heats up the Earth, exacerbating the greenhouse effect; this increases the rate of evaporation and therefore the amount of water vapour in the atmosphere which in turn exacerbates the greenhouse effect. Chlorofluorocarbons (CFCs) are found in aerosol sprays, fridges and other sources. CFCs are very persistent and can last up to 60 years. CFCs are thought to be the cause of a dramatic widening of the hole in the Earths ozone layer in the 1980’s. Ozone is important as it protects the Earths surface from ultra violet radiation (UV). If the ozone is damaged more UV light can get through to the Earths surface which could cause a higher incidence of human skin cancer. Global warming has two primary consequences: a rise in temperature and a rise in sea level. A continuing increase in the Earths average temperature could have a dramatic on the world as a whole. It is predicted that a rise of as little as 40C could lead to the melting of glaciers, ice sheets and ice caps around the world. There is currently approximately 25 million cubic kilometres of ice on the Earths surface. The melting of the Greenland Ice Cap alone could increase the sea level by 7.4 metres, inundating all low-lying coastlands. An increase in temperature could lead to more frequent heat waves, higher rates of evaporation and precipitation, which could certainly increase the strength and frequency of tropical cyclones. Below are a number of boxes illustrating the possible effects of an increase in the Earths temperature.